The aggressive image creation of the eighties unites in a singular way eclecticism (as an expression of the relation to historicism), expressivity (the wish for direct expression of Ego), and individual mythology (the cultural integration of Ego into different spiritual systems). All this manifests itself through a sort of “indifference” based upon the fact that the Utopian illusions, the social “doctrines of redemption” and, most of all, the positive, optimistic assessment of the relation between art and society; have all become stale for the artist. This is in rapport with the CRISIS OF EXPANSION. In fact, Achille Bonito Oliva speaks of a crisis of the principle of development and regards the entire avantgarde culture of the 20th century as an artistic manifestation of the neo-positivist principle of development. Oliva considers the attitude that the avantgarde culture is developing and the relation between art and society is progressing, is basically false and illusory. He declares that all development since World War Two has essentially been variations on Duchamp’s model and may thus be regarded as a sort of linguistic Darwinism. This conception presumes a direct logical development, the necessarily straight, passable way of arriving from anywhere to somewhere; that is, the logic of development. There for it has to banish numerous non-logical adventures, detours and isolated phenomena of modern arts, and for the same reason it has to stigmatize as conservative stagnation anything not proceeding towards gradual DEMATERIALIZATION, irrespective of whether the model is a conceptual or an abstract one. As a matter of fact, expansion no longer exists for the arts of the eighties! It makes no sense to speak about artistic action expanding gradually beyond its own borders, step by step enmeshing and transforming the non-artistic domains. In the view of the social utopianism of the sixties, artistic action was nothing other than one social act among many; the essence and purpose also of art was to create a new culture, a new social attitude. The MEDIUM EXPANSION of art was thus not merely a technical issue, but an essential question of the activist art which revolutionized society. Pop Art and Happening, Fluxus and Concept Art, Minimal Art, Body Art, Land Art and Video are the principal carriers of this MEDIUM EXPANSION. In those times it was a matter not only of exporting the media, but also of exporting the Utopian targets. This expansive trend is interpreted by Susan Sontag as a chance of creating a new intuitive and cultural unity. As opposed to this comprehension, the art of the late seventies and the early eighties is based on the fact that art continues to be a specific cultural sphere, while social (political and economic) practice continues on the basis of its own implacable and utilitarian motives, ignoring the phenomena of the cultural sphere-in fact, expelling them to the peripheries. Of course, it integrates art as “merchandise”, but no longer as a “spiritual sphere”. This provokes the cultural disillusionment and pessimism of the late seventies and the early eighties as well as that “indifference” described by Oliva. According to Oliva, “indifference” resembles the condition in which the average man switches from one television program to another without becoming absorbed in any of them. He is simply rushing among image symbols that seem familiar, but to which he remains indifferent. The artist of the eighties can also turn to whatever style he likes, because by itself style has no significance for him-the significant will be only what he, the artist, will add to it, i.e. the trans-substantiating element of the subjective gesture. The new artistic attitude is thus hyper-sensitive and subjectivistic. Its “style” is eclecticism. In 1983 SI-LA-GI produces the complex of images pointing out most definitely the artistic program of the radicalisation of eclecticism. We might well call this effort a “subjective eclecticism”, since the fundamental intuitive core of consciously accepted stylistic eclecticism is actually radical subjectivism: the selection of the motifs that are most important for the personality, the life, the fate, the roles, the “individual history” of the artist, and the conversion of sharply diverging ways of artistic self-expression into a pictorial metaphor, a fixed quasisymbolic moment. When we see on the picture “Trigon” the motif of the Venus of Milo embodying the Hellenistic beauty ideal, next to it the motif of Michelangelo’s David and to the right the hardly perceptible motif of a sitting Buddha, we perceive the embarrassment of cultural “over-saturation” and of the accumulation of motifs, and at the same time the immense tension between the automatic brush-work of gesture painting and the conventionalism of the individual forms, which have become symbols. This tension results at the same time from the individual fate of the artist, from his experiences and intentions, in the last resort from his own existence, because it was he who wilfully composed the image by arranging the different motifs. The motifs give the impression of an IMAGE METAPHOR; they stand not for themselves, nor do they mean only their epoch or their cultural environment, but include also the artistic gesture of the artist who-as an individual-has raised them from somewhere in order to force them into his own image. 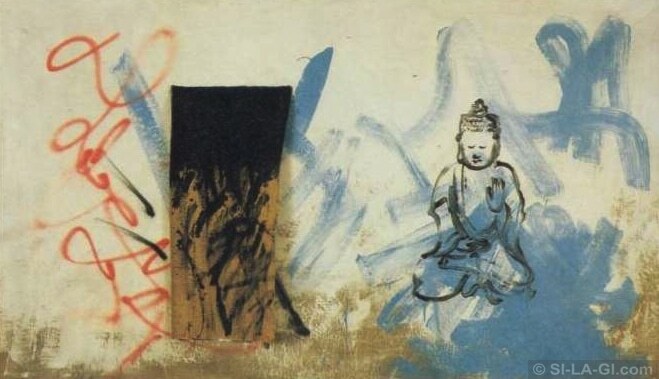 The superficial division of “Trigon” (to the right: white surface, to the left: raw canvas with grey and blue spots, the two fields being in a proportion of circa 2:1) separates the motif of the Buddha sculpture from its two European counterparts; whereas the products of European “classic” art are distinctly set off by the thick contour drawing, the Buddha sculpture almost disappears in the upheaval of the white surface and the red lines on it. By its classicistic striving after the essence and its strict linearity palpating the characteristic forms of the sculptures, the contour drawing offers a sharp contrast to the elementary and primary uncontrollableness of the gestures of painting. This irritating element is also present on the other pieces of the picture complex: on the recumbent “David and the Chair” and on the upright “White Venus”. Both pictures elaborate an image metaphor of cultural history, since the Venus of Milo and Michelangelo’s David are not simply sculptures or works of art, but representative products without “topos”, having been popularized on millions of reproductions currently used as emblems on advertisements, packing paper, cosmetics or even blue jeans. As such, they can be equally parts of “high culture” (elegant albums, catalogues of museums, documentary films of art history, diapositives, etc.) and of cheap “commodities” of “non-art”, of business and advertising, in short, of everyday life. 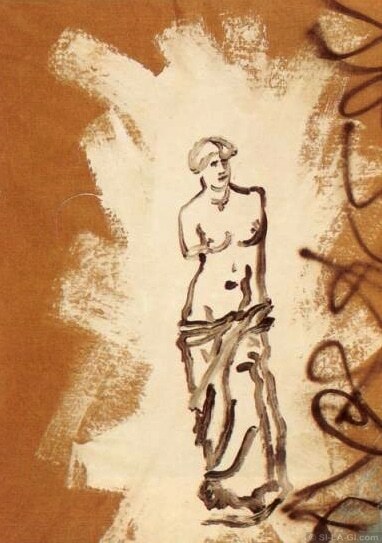 This gives by itself an attractive diversity to the two motifs, with the “counterpoles” still to be added: Next to the classicist and objective outlines of the “White Venus” there are some black scribbles which may be the most trivial “pictorial gesture”, for instance on the wall of a subway station, on the paper of a poster, on a bare wall or on the glass of a display window. In the picture “David and the Chair” there is, to the left of the horizontal David motif sketched with dripping black paint, a clumsy chair, its banal objectiveness reminiscent of a high-school study. Here too, the gesture is present in the vigorous silver stripes painted on the chair and in the ground-coating thinned out in the lower part of the picture. Here, however, the chair is the decisive “counterpole”, in its simplicity, its massive clumsiness and incomprehensible “emptiness” burdened with a certain inexplicable feature. “The Gate” is also based on contrasts existing, on the one hand, between the precisely recognizable figure of Buddha appearing as an exact object, i.e. as a sculpture motif, and the mysterious though banal “gate” motif, and on the other hand, between the primary gesticulation and the disciplined descriptive graphic motif. The former contrast is present on the field of the pictorial topos, the latter on that of painting, on the surface of the image. This surface is the area of free, unrestrained gesture absolutely identified with itself: EVERYTHING IS ALLOWED here, nothing is forbidden by any convention, constraint, puritan moralizing or aesthetic formalism, since aesthetic formalism itself is one of the “roles” or “courses”, where the artist can move at will. At the same time this “everything is allowed” attitude is obviously not “pleasure-painting”, but results from a sceptical and defensive world concept. This complete and radical eclecticism has become possible because a single closed aesthetic system is able to transmit those complex meanings, including, ambivalent, extremely antithetical poles that may present themselves before the artist by the end of the 20th century. The picture thus becomes a subjective “drill-ground”, a subjective “relief map of gestures” where every kind of building and every kind of landscape may be simultaneously and collectively present in a completely arbitrary arrangement. The coarse, brown piece of canvas hanging next to the Buddha, smeared with black and scribbled with red, can thus be everything: entrance into another world behind, or a blind door opening nowhere just as behind the plane of the picture there is no opening; but it can also be a symbolic evocation of an abstract conceptual world, just like the sculpture of Buddha appearing in an abstract white field suggesting infinity and indicating a world of an objectless and unidentifiable thing. However, all this can be also nothing but a “background”, a bare wall on which the coarse outlines of the Buddha as well as a piece of canvas are applied, almost with the banality of a poster, and where the blue and black and red stripes of paint and all the faceless, impersonal gestures are but the nonchalantly sketched traces of an unknown hand. What is so exciting-and authentic-in all this, is precisely the polysemic, ambivalent saturation including even positions opposed to one another; the visual materialization thereof is image eclecticism where the tradition of gesture painting appears just as much as the radical subjectivization of the tradition of emblematic communication as practised in the sixties. This includes the observation of the “individual mythologies” of the seventies, the egocentric feature of Spurensicherung creating the one-man history, the archeology and anthropology of the artistic peronality. However, all these trends existed within a quasi-system set up by themselves, whereas the radical eclecticism of the eighties, the subjectivist new painting, denies the system itself. It actually regards the image as an autonomous “personality” just as incalculable, individual and unique as the artist himself. The image thus becomes detached from its creator as well as from the narrow context of its suroundings; it breaks loose from any program and system, denying by its own existence every kind of model. The image simply exists, but it does it with such suggestivity, such radical saturation with energy and such inexhaustible profusion of associations, that it forces the world to accept its existence in spite of the fact that its radical individuality makes it impossible to integrate it anywhere or to force it into any model. This condition brought the artist of the 20th century to the point where he is able to go beyond his own former Utopian illusions, knowing he has transcended his own former expansionism, his “being-something-else”, and where he can indentify himself at the maximum with himself by his products, acting out his own position. He is not supposed to “teach”, to “educate”, to proclaim programs nor to penetrate into other forms of social action, but to transmit his own spiritual-psychic existence, to demonstrate his own condition as frankly and boldly as possible or to give shape to his own imaginative-fantastic forms. Of course, as the exclusively spiritual-psychical nucleus the point of emanation of the work of art, the ego can manifest itself in very extreme ways. It is one of the main characteristics of the painting of the eighties and thus of the new painting of SI-LA-GI as well, not to bear even the slightest trace of any monolithic attitude: spontaneous and automatic gestures are complemented with motifs of cultural history, pictorial topos, conventional signs or consciously adopted “stylisation” (that is, the specific formal-stylistic “evocation” of different artistic ways of expression), which, at the same time, gets inseparably superimposed on the layer of primary and expressive signals. Some works might be actually termed “condition-images” or image conditions. 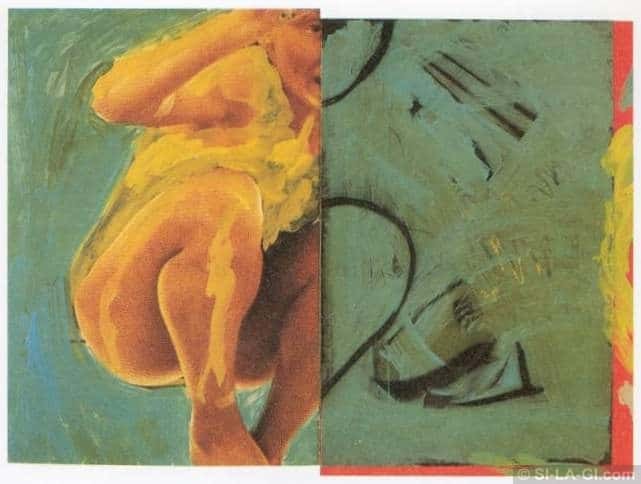 On two large-scale, variable series of SI-LA-GI, “Women” and “Trap” (1983) the imaginary conditions of the human body are concretized so that existing posters are repainted, whereby their original conditions are entirely changed. The posters themselves represent women, or men and women together, lined up on one of the series, and in different body postures (sitting, standing, crouching, jumping, etc.) on the other. These postures appear on the pictures either completey transformed or only significantly modified. Face, look and gestures are changed, the figures become frightful, degenerated or pitiable, hopelessly drowning in this chaotic and unfathomable world that they carry themselves. Their foolish, imbecile and grinning look incarnates a clandestine self-fulfilment which-secret and suppressed-can arise in nearly everybody: as a “game” with madness, as experimentation with the roles and the capacity of identification. The body fragments of the “Trap” are at the same time idiotic and impotent, aggressive and pretentious, frightful and disgusting. We have no supports or crutches, we have to look straight in the face of these distorted and degenerated figures, whose smiles are attached to everyday life, to the world of advertisements, of television, etc., but incorporate in reality all our latent, suppressed conditions, conjectures and imaginary positions. 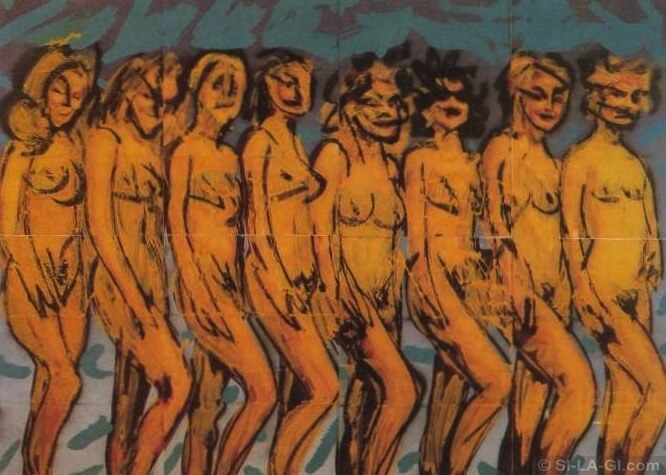 Wolfgang Max Faust is right when speaking about “wish-images” (Wunschebild) in connection with the painters of Italian trans-avantgarde, but this artistic attitude is generally characteristic of the new painting of the eighties. The impulses aimed at transmitting by means of an image the fixing and at the same time the “transformation into a happening” of the momentary existence and psychic condition have a most vigorous effect on the pictures of SI-LA-GI. In his pictures there are often “story-like” elements to be discovered, or some pictorial relations may be conceived as occurrences, suggesting condition of “before” and “after”. In these storylike pictures the “wish-image” represents the topography of an important event taking place within the imaginary domains of an image, struggle, conflict, death, emigration, return, etc. So to say, “picturesque” landscapes appear, events take place or are suggested, “victims” and “victors”, martyrs and survivors, the weak and the strong, the submissive and the struggling-they all are tangled up in a chaotic, extravagant, unbridled and fantastic dance. Banality and extravagance are not only intertwined, but also regularly alternating. The distorted, awkward, unfortunately wriggling figures eventually get as far as grotesque, while becoming inevitably tragic in another case, sometimes even irrespective of the artist’s intention. In some of his pictures SI-LA-GI repaints the figure-originally a man-into a woman, increasing thereby the feeling of uncertainty and ambiguity, but ridiculing at the same time the “original” figure. These figures may become cruelly delivered to the mercy of anybody and ruthlessly aggressive as well, swinging from one extreme to the other. The pictures of SI-LA-GI may be regarded as the “prolongations”, the imaginary play-acting of ego, as its wish-images and their reverse. The pictures “Midnight”, “11 to 5” (1983) and “Taste” (1980) are closely related to the problem termed “body-feeling” (Korpergefuhl) by Jean-Cristophe Ammann and appearing-according to Ammann-as a component of extremistic and radical subjectivism, beside the cultural gestures of “internalization”. 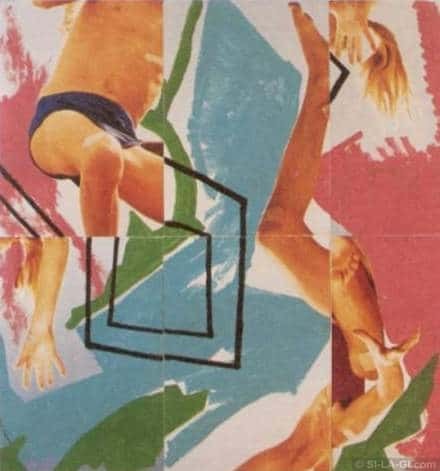 This “body-feeling” manifests itself in an extremist imagehood: the Image dons the imaginary “body”, projecting so to say the materialization of fantasies by the artistic ego with its own colourful, physical, individual existence and its radical presence. The image identifies itself with the body and becomes a physical reality, an independent being whose individual existence always remains incalculable, unfathomable, unexpected and shocking. This manifestation, “outwardly” most aggressive and pointedly surprising, is “inwardly” directly related to the most intimate experiences of ego, such as the emotional experiences of wakefulness and sleep, ideas about death, on love, affection, jealousy, attachment, to the fading world of reminiscences which, however, is often aggressively sharp and vivid: in short, to the intensified intimacy sphere of ego. The picture “11 to 5”-recumbent bodies primitively painted in elementary forms on a canvas simply nailed on the wall and scribbled all over with red, blue and whiteexpresses, in spite ofi the brutality and the aggressive fissures on the painted surface and despite the red stains associated with blood, the defencelessness of the sleeping man, his childlike mildness, his “pure” and purely “irresponsible” detachment from the realities of the day, his helplessness and unconscious exhibitionism. This is also ambivalent, for sure, because it is associated with the unlimited “freedom” of the sleeping (or dead) man roving at unearthly distances, with the realm of dream where “everything is allowed”, but it also expresses at the same time the self-revealing, defenceless and mute, frightful solitude of man, lying asleep as a lifeless piece of stone. The concepts of sleep and death, of sleep and dream or of sleep and solitude are linked with the primary and elementary projection of the “body-feeling” : it is again the simultaneous presence of extreme poles which induces tension into the world of the picture. The life-sized, sleeping bodies of the artist and his wife, appear like spots framed in rough contours recording the positions they take in their sleep. At the top they lie one behind the other, with their legs drawn up and their arms out stretched, echoing the movements of one another, while at the bottom they are separated from each other, in different postures, almost without contact. The barbarous, primitive form of expression of the elementary and direct signs is torn up by the hectic, baleful and nervous rhythms of scribbles, the rude black linear rhythmics of the ground transpierce like arrows the helpless bodies. The dream becomes saturated with upsetting, inscrutable, wild contents, whereas the bodies are lying in their touching defencelessness as lifeless objects. The same strange dream-being is formulated by the huge picture “Midnight” (1983) with the dancing rhythm of red and yellow bodies, the barbarous primitiveness of black sun-disks and the rude informality of the legends (Sunset, Midnight, Sunrise). Appearing in different postures of sleep on the grey canvas, the red and yellow human couple is almost floating in space. There is no feeling of physical weight, nor of defencelessness or spontaneous junction. The decisive features are much rather the primitive expressionism, the rude and vital informality of graffiti, their emblematic character transcribing sensuality into signs. Painted in 1980, “Taste” is an action-image expressed by means of elementary pictorial signs: tasting, licking something to become acquainted with its taste, its surface, its coldness or warmth. It is an unusual action-image ideed, because there are but very few elements indicating the real action; the picture is rather saturated by the tension between the outrightness of the associations and the reduction of the signs. Nailed on the wall, the crumpled canvas is roughly painted black; to the left a white and green line indicates the head tasting, with its outstretched tongue, a slanting white object; to the right, an equally oblique white streak with a red stripe is surmounted by a zigzag line sprayed with blue and white. Due to the hazy edges of the sprayed white stripes, the emblematic sign of the head as well as the zigzag lines on the upper right side of the picture are slightly floating, whereas the two white forms cutting into the black ground are stable and hard. These forms may be equally concieved as massive objects standing in front or as “fissures” in the black ground, transmitting a message from the “real” space. The profile with the tasting tongue wishes to penetrate into this “fissure”, attempting its immediate physical perception. In examining one of the main trends of SI-LA-GI‘s activity we arrive by means of chronological retrospection to the early works he painted in the late sixties, which are in a striking way most closely related to the attitude of the pictures he was to paint almost ten years later. The pictures (1) “In the graveyard” (acrylic on canvas 87 x 63 cm 1968) and “Grief” (1968) as well as (2) “Bloody Torso” (oil on canvas 125 x 95 cm 1969) and (3) “Destroyed Body” (ink on canvas 82 x 55 cm 1968) all belong to the province of dramatic self-expression. They all have in common the expressive, emotionally inspired brush-work carrying the dramatic contents directly up on the canvas, but preserving the psychic stations of the painting process. They also have in common the need to transform figural motifs into elementary pictorial signs. 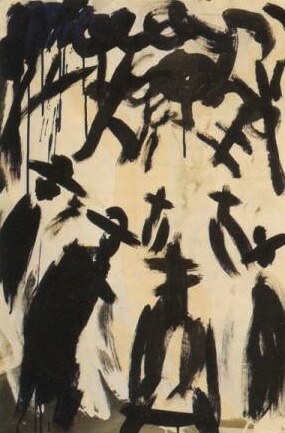 While on the pictures “in the Graveyard” and “Grief” from (1968) the narrative, describable event is still more explicit, the “Destroyed Body” painted a year later presents only a horrible trunk, a detail of a mutilated, tormented, bleeding, body, with a suggestive directness and an intensified “body-feeling” that will be characteristic of th Italian “trans-avantgarde” of the seventies, particularly, the works of Francesco Clemente and Enzo Cucchi. Formed with black trickling and splashing, as well as with harsh, grave and irreversible brush-work, the ghastly torso of the “Destroyed Body” (1969) is an “image of conditon”, the frightful expression of torture and physical pain. The head does not remind us of a human head, but rather of that of a bird. The trunk is without arms: only the shape drawn with shoulders and two breasts is associated with a female body. Although no natural element is present, the splashed and sprayed black paint reminds us of blood, while the hard black lines and the dark spots dissecting the mutilated body give the impression of ruin and dismemberment. The suggestivity of the picture, the anguishing and ruthless directness of reception based on empathy, indicate such artistic intentions which conceive the province of extremist self-expression as the projection of the dramatically experienced and fictitiously endured “human condition”. The freedom of imagination and the accumulation of dramatic tensions is aimed at the pictorial formation of this “human condition”: the independent corporality and the painful materiality of the image, its rudely presented misery-all this suggests the extremist conceptions of the “human condition” not in an abstract, but in a psychically concrete way, in the directness of “body-feeling”. Although more emblematical, the picture “Bloody Torso” is equally extremist in its visual world. The work is not as directly saturated by the “body-feeling” as in the case of “Destroyed Body”. The mutilated human body, reduced to the basic forms and becoming symbolic, as well as the horrible, bloody sight of the arms and the head cut off-all this becomes a primitive, idol-like form. The thick black line cutting the picture in half divides the world into a green field and a blue sky as simply as the primitive human symbol drawn with thick black outlines expresses Death, or more exactly: the act of murder. Suggestive in its symbolism, this form is barbarous and ruthless; however, the primitive and simple drawing, the primitively represented blood, generalizes the imaginary condition rather than concretizing it. It is not the psychically inspired inner identification but much rather the generalization and reflection due to symbolism which corresponds to the spirit of the work. While “Destroyed Body” is the frightful, dramatically impressive manifestation of the artist’s fantastic act of self-investment “Bloody Torso” is an emblematic formulation of modern barbarism, captivating precisely by its primitive simplicity. 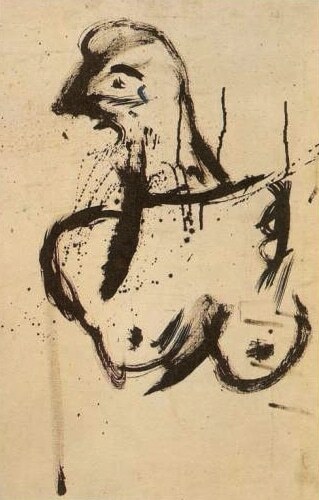 In a remarkable way, “Bloody Torso” is ahead of the primitivism characteristic of the “heftige Malerei” practised by German neo-expressionists in the seventies, but also of “trans-avantgarde” manifestations deriving from the drastic, ruthless and extremely concentrated spontaneous expressionism of city graffiti. Motivated partly by death and partly by aggressivity and defencelessness, these four early pictures are thematically related to SI-LA-GI‘s later works. The “story-like” conception is also cognate, just like the hectic world of emotions based on antagonisms and dramatic conflicts. At the same time, of course, these early pictures are less elaborated, more spontaneous and less interested in questions of composition; as a consequence, they are actually less intellectual. 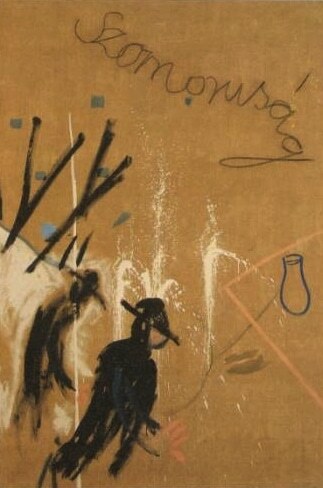 The later works are virtually always marked by the presence of a “metalinguistic” sphere of questions dealing with art itself (either by motifs, or by solutions of composition) whereas nothing of the sort can be observed in the works of the late sixties, although they are of a surprisingly topical and up-to-date attitude. The emotional contents, the pictorial expressions of a dramatic world concept that are all the time saturating the works of SI-LA-GI are busting ahead spontaneously, in their own elementary liveliness and unrestricted ness. By the seventies his interest had obtained an intellectual quality through his experiences with conceptual art, with actions and videoworks. 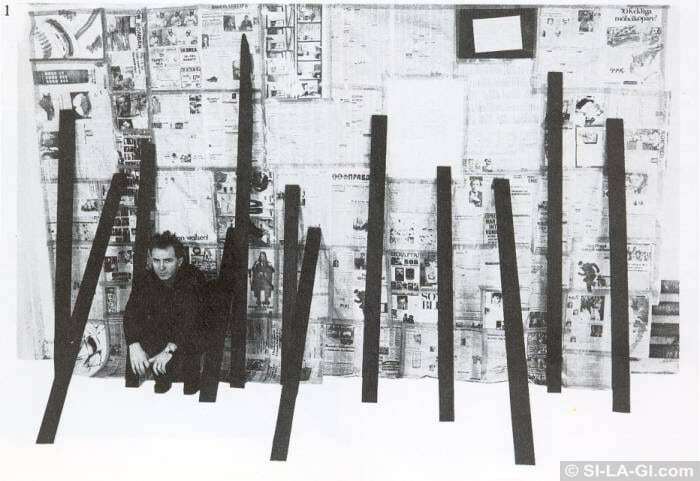 It seems that the two poles are more closely interlinked in the attitude of pictures and installations made in 1979/80. This, of course is also connected with the fact that the conceptual works composed in the second half of the seventies contain abstract intellectual and concrete (though generalizable) social themes, whereas the works made in 1979/80 are marked by the intensification of subjective fantasy, of the presence of personal “wish-images” and imaginary “self-fulfilments”, as well as by a new and increasingly individual conception of pictorialism. The independence of the image increases considerably. The decisive contents of the images painted in the eighties consist of this subjective realm of imagination of the non-model-like, but individual and non-recurrent formulations of subjective Ego-materializations. This change of attitude adapts itself to the overall processes of art interpretation of the eighties, marked by the prominence of the artist’s personality, by the disappearance of predominant stylistic trends, the development of a new eclecticism, the radical change of art’s social positions and by the transformation of extroverted artistic activity into introverted action. Stepping out of the world of the painted image we are going to treat now the environment-work “Wailing Wall” (1981) and the “Now”-variations (1981). Both works are strongly attached to the conceptional and the semantic world of the purely painted works. The large-scale mural surface of the “Wailing Wall” is plastered all over with newspapers, texts, the printed catalogue of a photo series representing one of the artist’s actions, and with a few pieces of painted paper; leaning aslant against the wall, black battens stand as grim, menacing and aggressive objects, dividing, wounding and cutting the wall and almost piercing its surface. Their hectic rhythm is uneven, wild and harsh-no sign of any close order, unless we consider the limited mural surface as such. Nevertheless, the aggressive reality of the black battens makes us inclined to think as though we were pressed in a closed, narrow and stuffy room, in a prison or a crypt where the only thing that remains to be done is to browse in the small letters of the newspapers, which surround the black boards. The minute texts of the wailing wall thus obtain the sense of a sort of “atonement”: they may be the notes of people who were there ahead of us, their messages scratched on the wall, their complaints or confessions, but it is also possible that they concern ourselves, and we must read them straight through, in expiation, to realize what we have actually done and where we have trespassed. However, all this may just as well be our own complaints, notes and confessions, weighing heavily on us by confronting us with ourselves. The heavy burden of confrontation with spiritual and moral questions is further increased by the suggestive expression of physical defencelessness, the whole situation being branded by the brutality of the black boards. Our feeling of defencelessness is intensified by the accentuation of the quantitative moments: covering the whole wall, the many texts composed of small letters are a heavy burden (the lengthy reading is a sort of task, the occupation with the complaints and confessions of others and of ourselves is a sort of penitence like the prayer after the confession) comparable with the menacing and brutal mass of the black boards. This physical-quantitative expression strengthens at the same time the double artistic aspect of “Wailing Wall”: the work can be conceived both as an environment and as the installation of an action. SI-LA-GI himself considers the latter to be of some importance, since he has made several photos of this work, in which he appears as part of the composition, that is to say: he carries out an action in the spiritual space of an installation set up by himself. Environment and action as double “reading” of the “Wailing Wall” recur in other compositions as well. The double interpretation of the picture actually occurs frequently in the art of SI-LA-GI: on the one hand as an image, i.e. as a material, concrete object with independent corporality and a fate of its own, while on the other hand, as an object of outstanding importance belonging to material apparatus of an aciton. 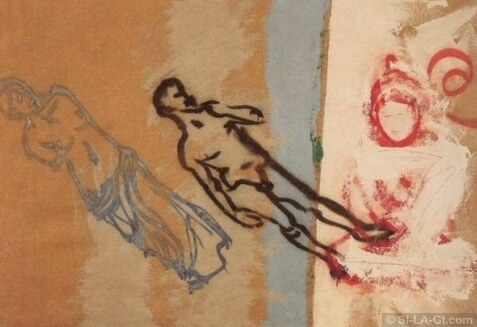 This outstanding importance is due to the fact that whereas other objects do not originate from the artist’s hand but are merely accidental as compared to his individual style, sign and gesture, the image derives directly from the artist, bearing his own gestures, and is thus an “individual object”.